Do you have hard water? Do you want to use less dishwasher or laundry detergent? Then the Magnet Ball is for you! 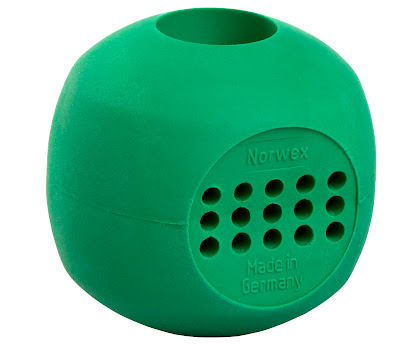 The Magnet Ball prevents calcium and lime build-up in dishwashers and washing machines. It is a magnet covered in hard green santoprene - a rubber-like compound. The strength of the magnet is 210 Gauss. By placing the magnet ball in the dishwasher, it softens the water and allows you to use half the normal amount of dishwashing detergent. Just place the magnet ball in the bottom tray and use half the amount of dishwasher detergent you'd normally use. The Magnet Ball comes with a 5-year warranty and is 5 cm x 5 cm x 6 cm / 2" x 2" x 2.5"
Please note, the Magnet Ball is not recommended for front loading washing machines as not enough water passes through the magnet ball, and given the rapid and vertical spin of these systems, use of the magnet ball in them may result in damage. It is recommended that you clean the ball by running a microfiber cloth through the center every month or so. This helps prevent metal and mineral build-up from re-depositing back onto clothing. 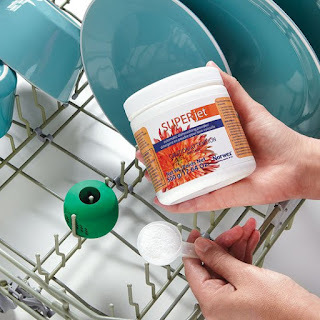 Why do you use less detergent when using the Magnet Ball? How do you clean the center of the Magnet Ball? Can you use the Magnet Ball in the back of your toilet tank?